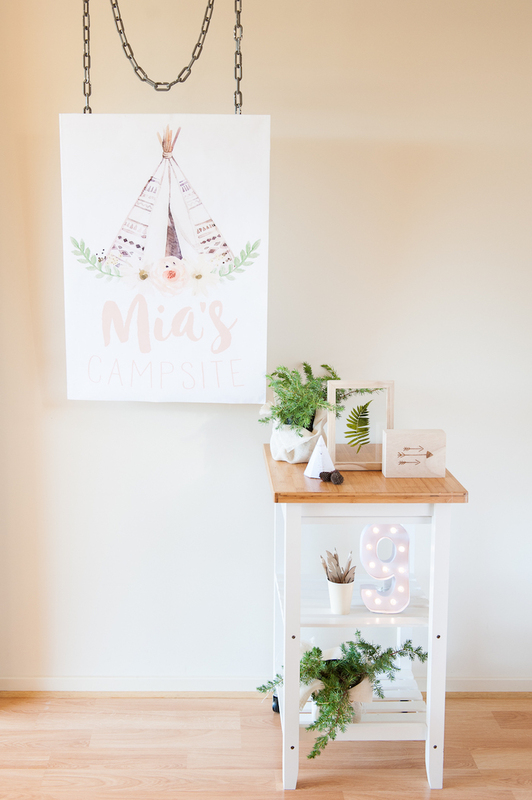 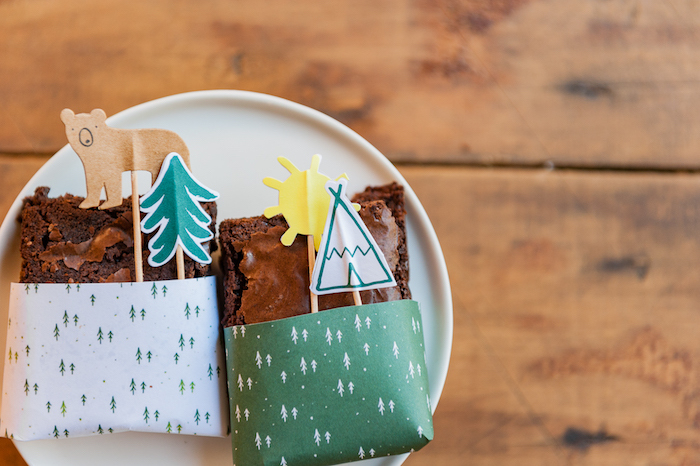 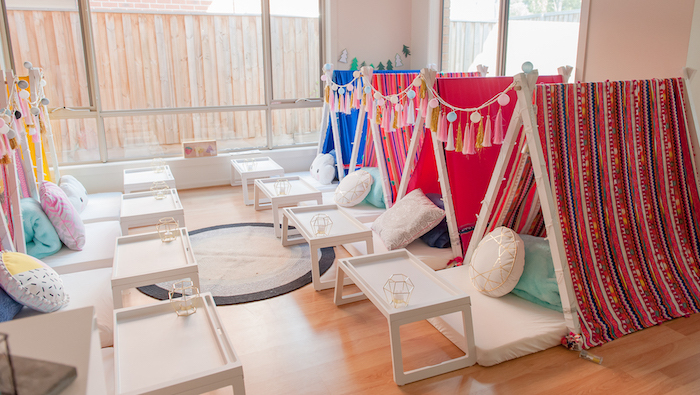 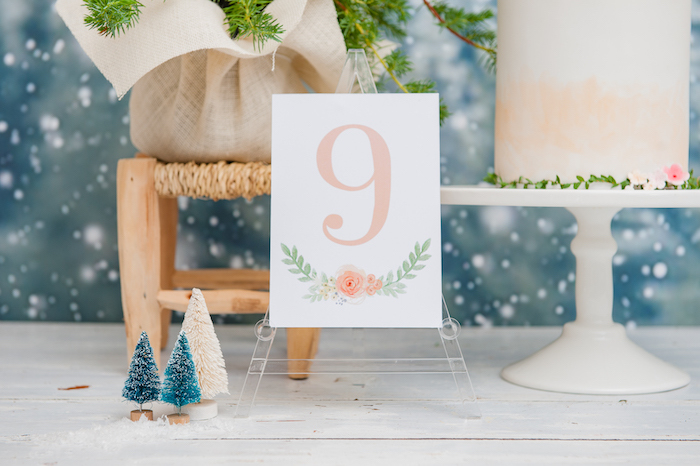 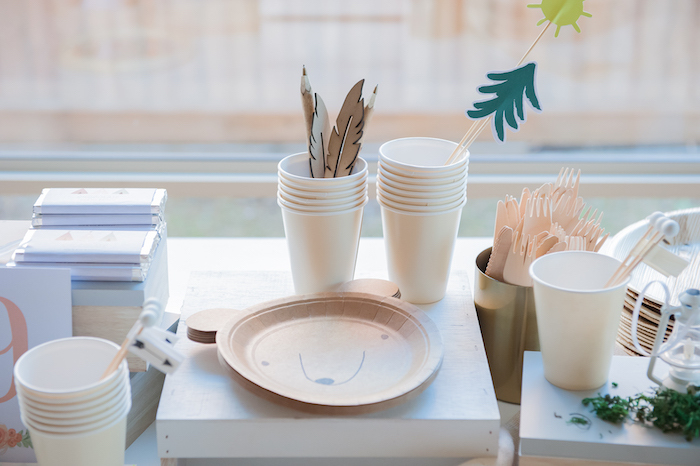 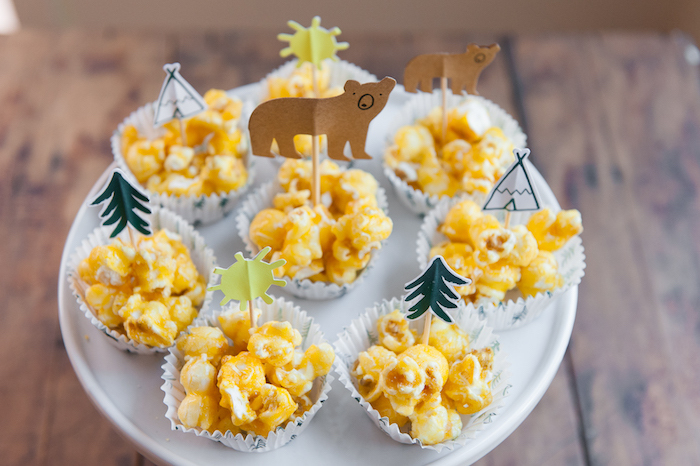 Gather round the campfire and warm up your toes, this Boho Winter Camping Sleepover Birthday Party by Kendra Plastow of Kendra Plastow Styling, out of Melbourne, Australia, will cure all of your party woes! 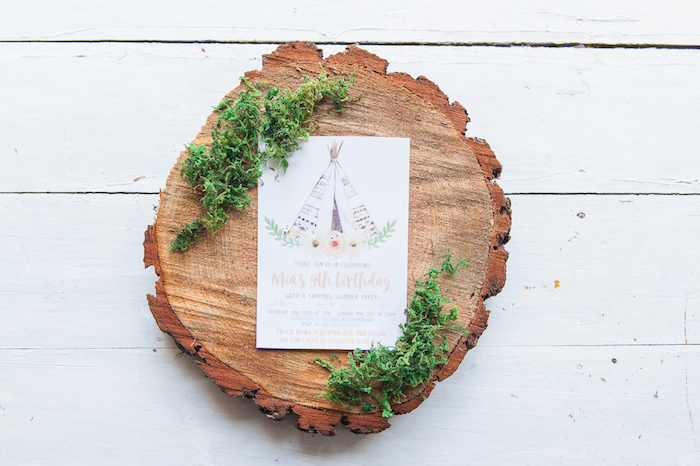 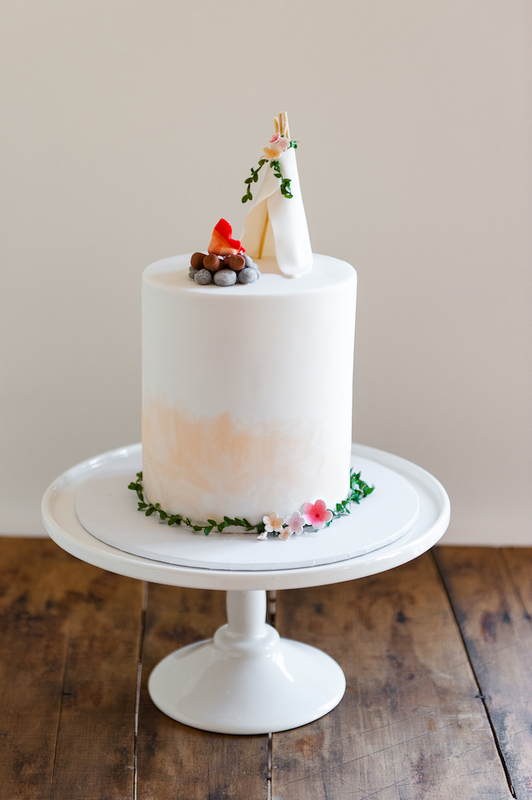 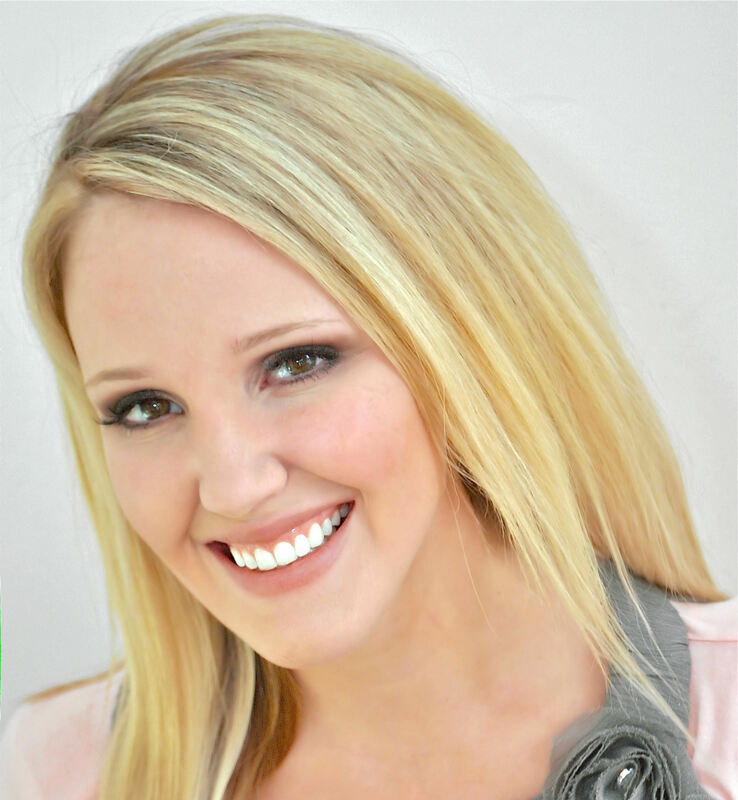 Filled with beautiful and rustic detail, this adorable celebration will not fail! 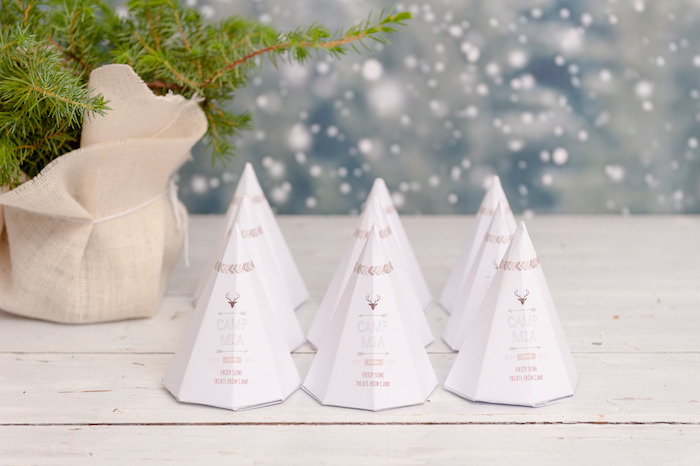 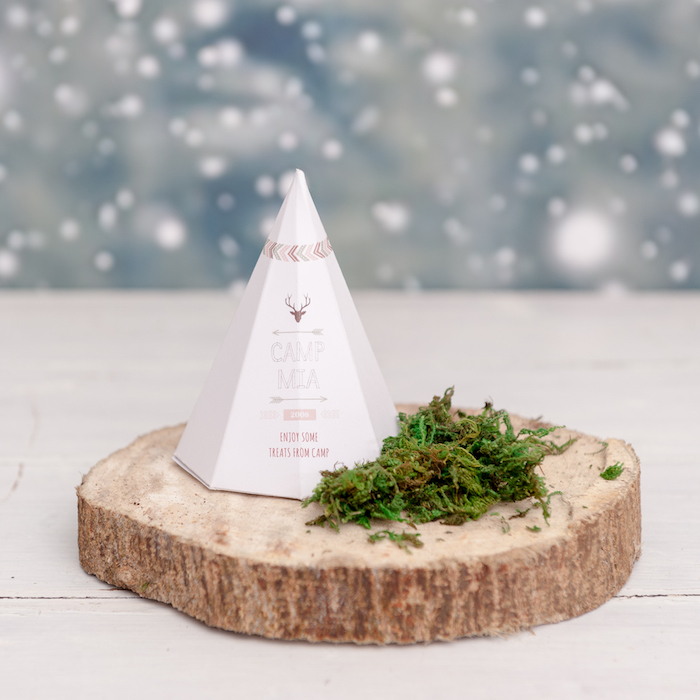 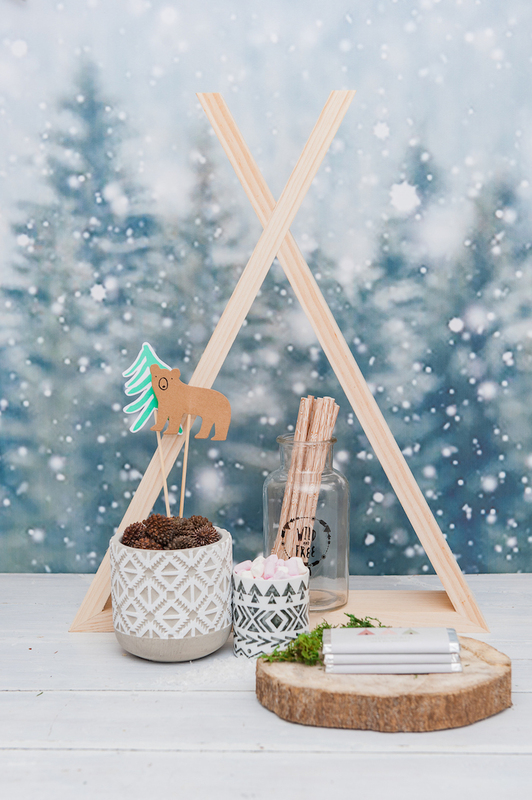 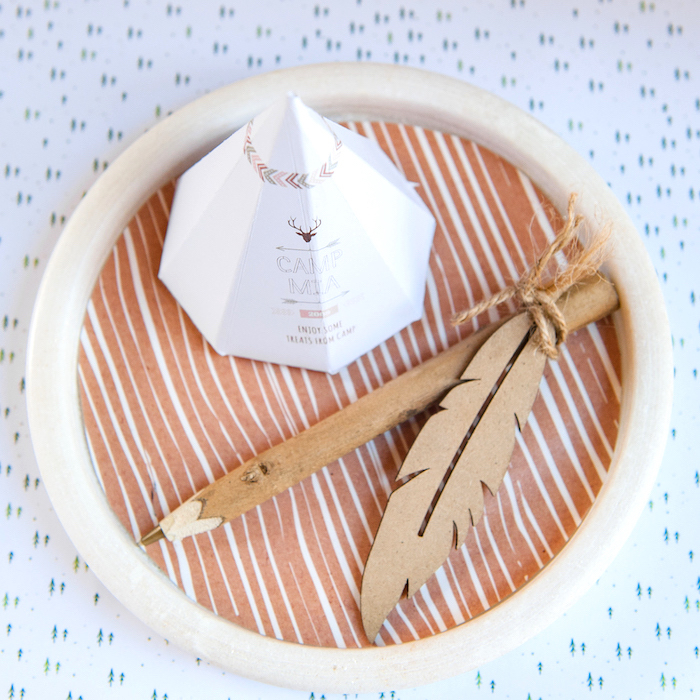 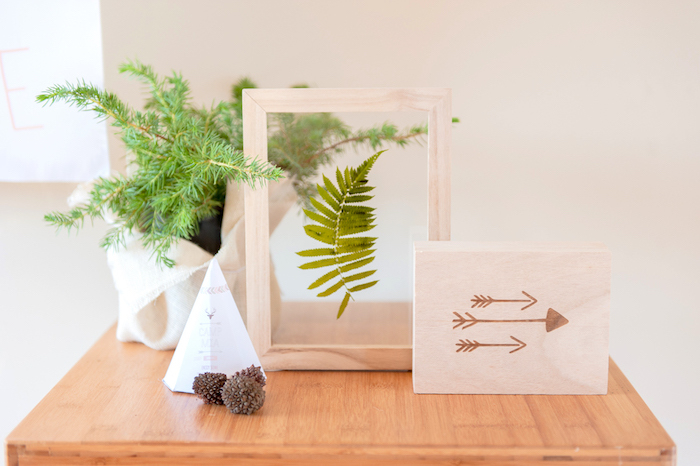 And cute teepee favor boxes! 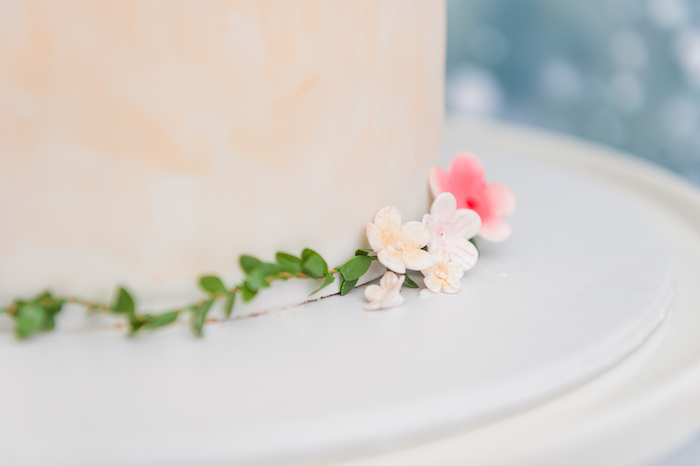 Vendor credits at the bottom of this post! 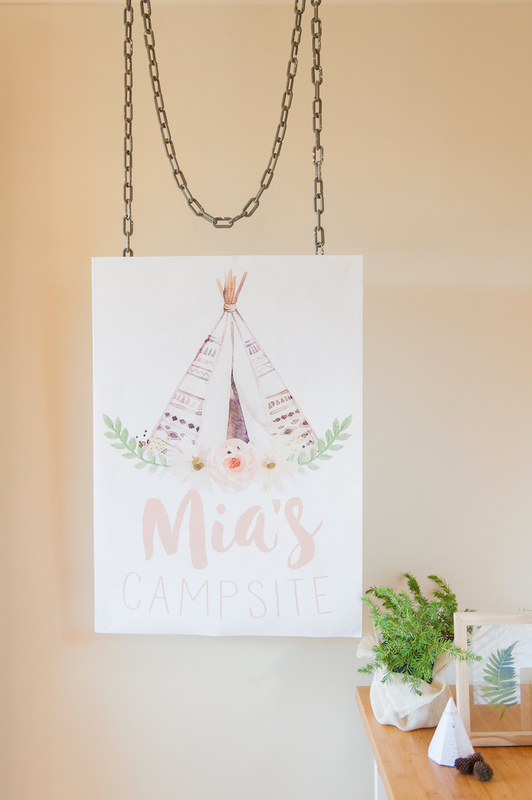 This is what Kendra shared about the party- “Mia had been asking her mum, photographer Lee Bird, for a sleepover party since her 5th birthday and at 9 her wish came true with a winter camping party! 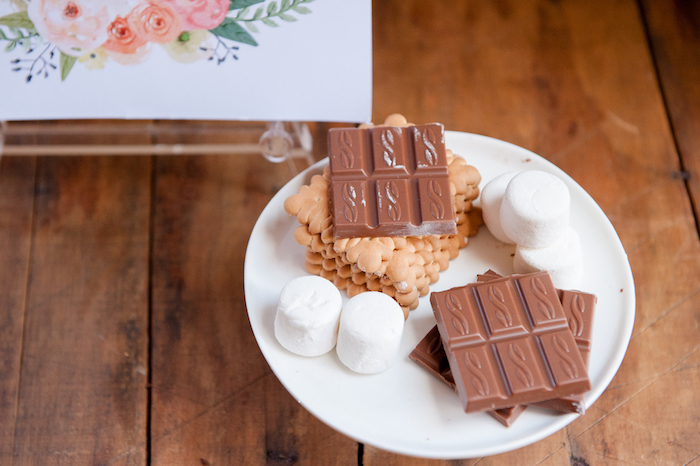 Mia, her younger sister Zoe and Mia’s best friends were treated to a beautiful chocolate cake, their own little tents, floral shaped ice creams & s’mores with hot chocolates in a cosy glamping themed party that had the girls giggling well into the night. 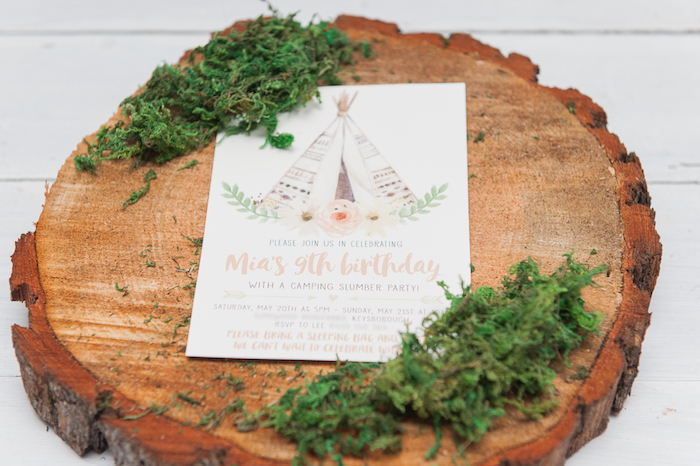 We wanted to create a party with a soft, feminine feel while still reflecting a love of nature, adventure and the outdoors. 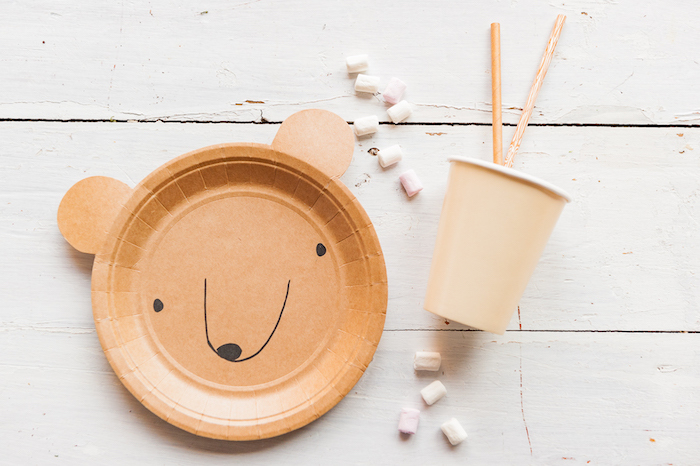 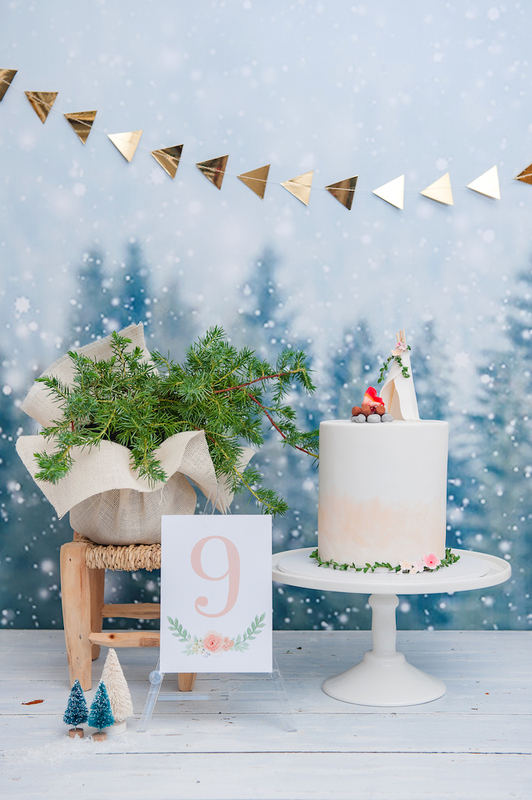 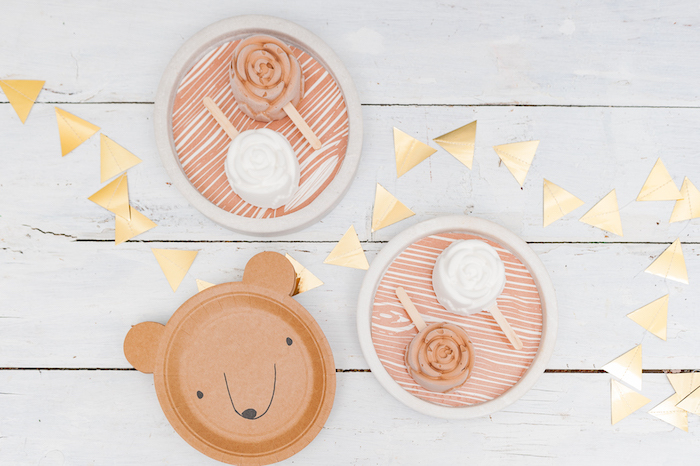 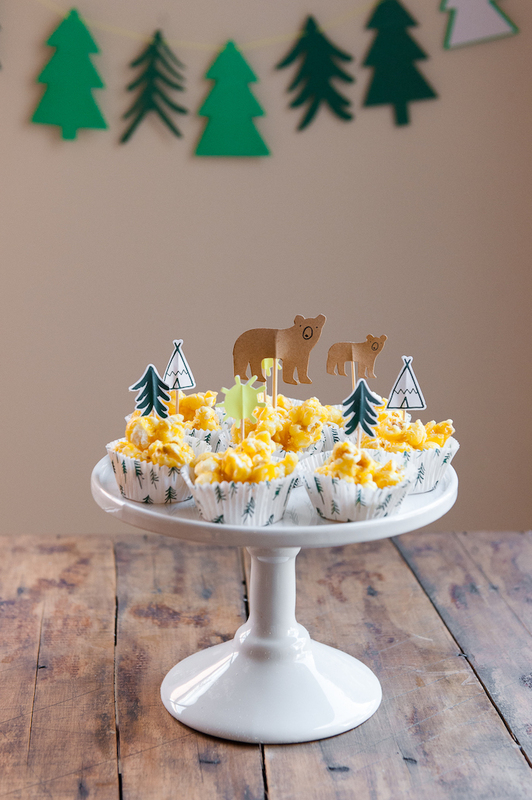 Playful partware was sourced from Melt bake and party including the ‘adventure awaits’ Garland, cupcake toppers, bear paper plates & ‘Let’s explore’ napkins. 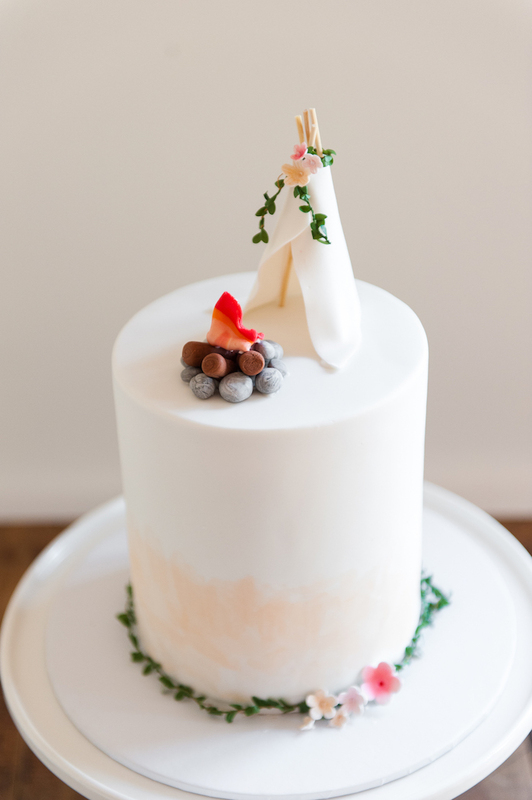 The lovely teepee cake by Debbi from Studio Cake complimented the invitations & the candle was tucked into the mini campfire on top of the cake. 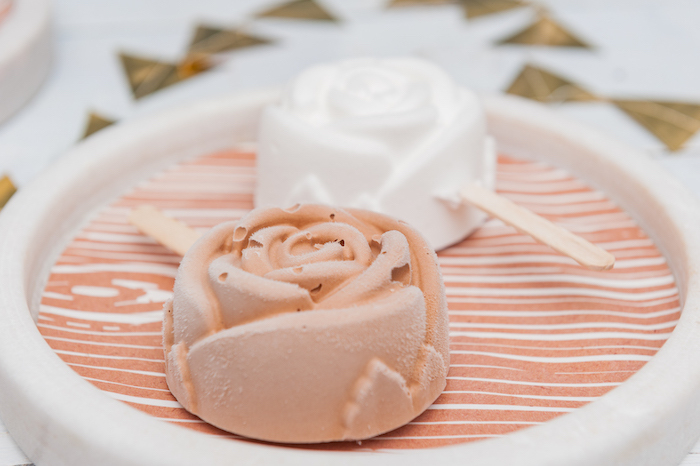 Popstic Ice Cream created hand made chocolate Ice cream & coconut Sorbet floral Popstics paired with chocolate brownies. 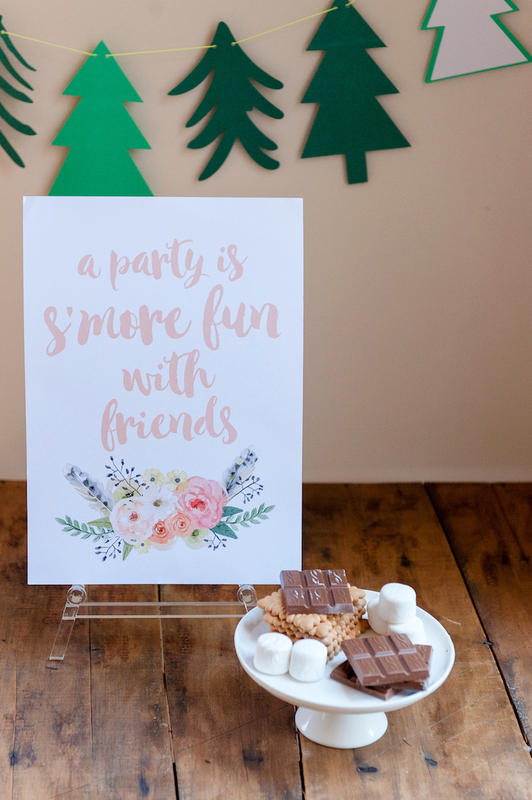 Dominique from Design & Donuts created the whimsical invitations, campsite & s’mores signage that set the tone of the party. 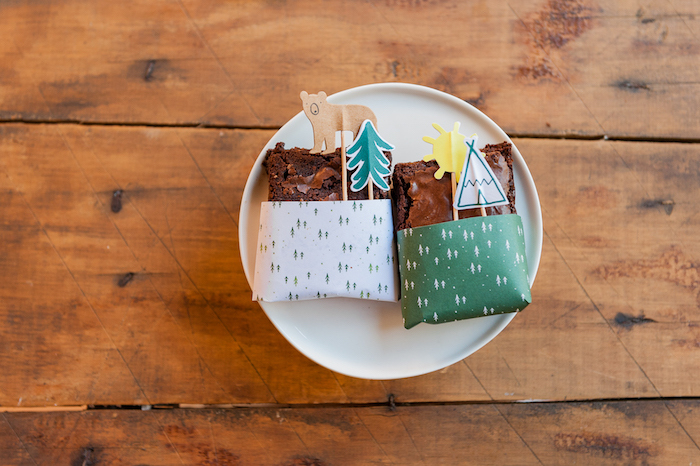 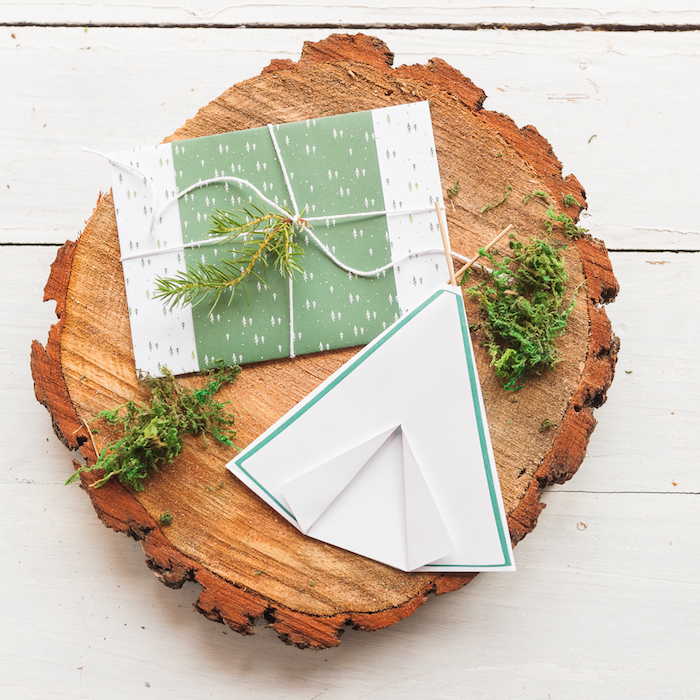 Invitations & chocolate brownies were delivered wrapped in white & green ‘mini forest’ wrapping paper sent from Clara & Macy in England. 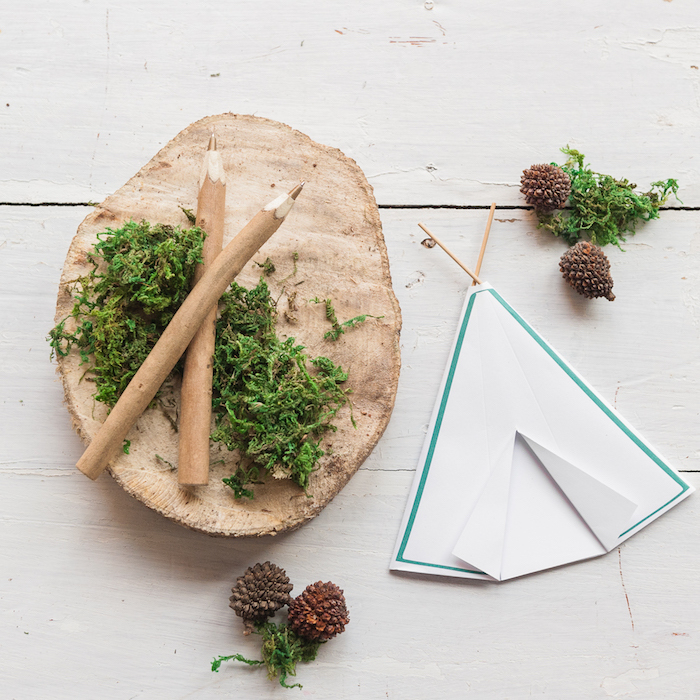 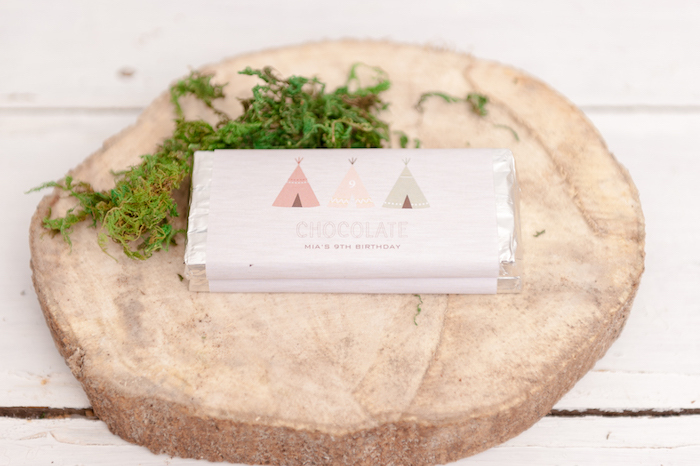 Jo Studio customised the teepee party favours (containing twig pens, stamps & marshmallows) and mini chocolate bar wrappers. 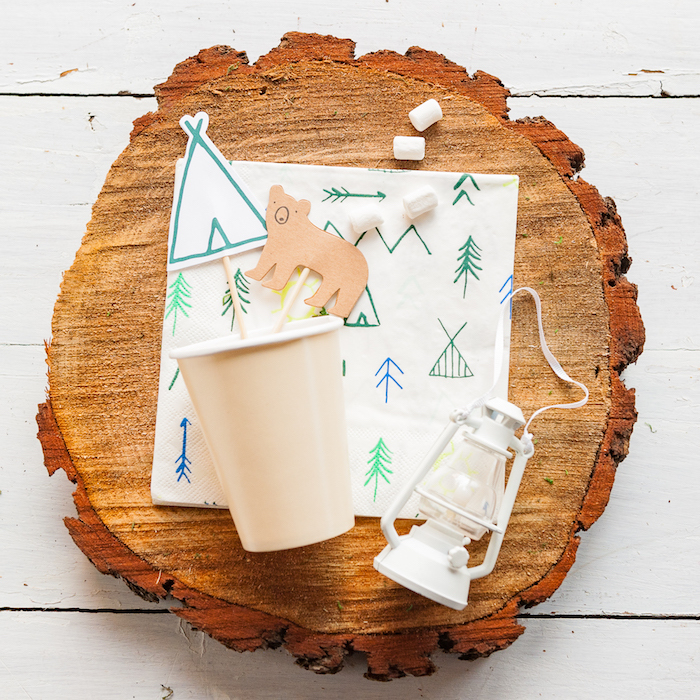 The girls hand painted T-shirts, made s’mores and chatted until early morning. 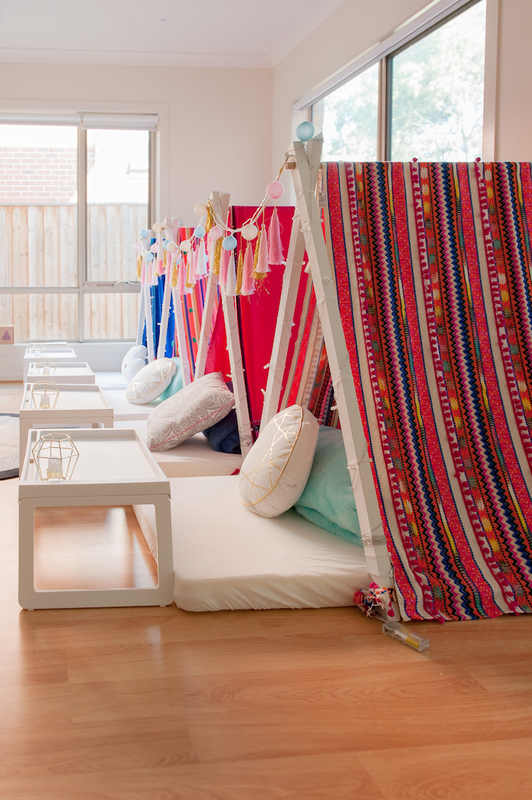 Now that’s a sleepover to remember! 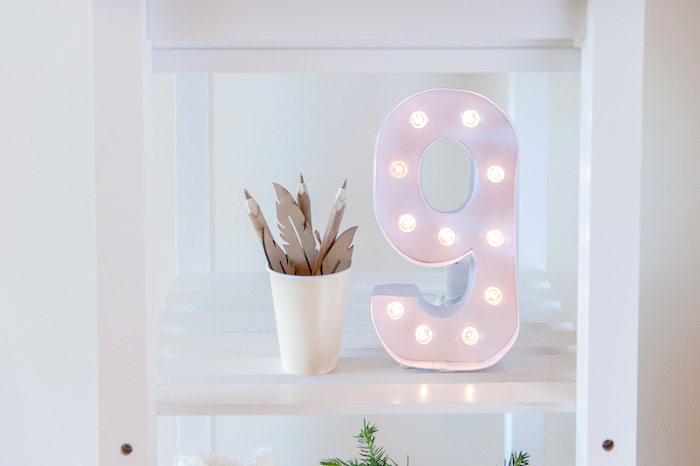 Happy 9th birthday Mia”. 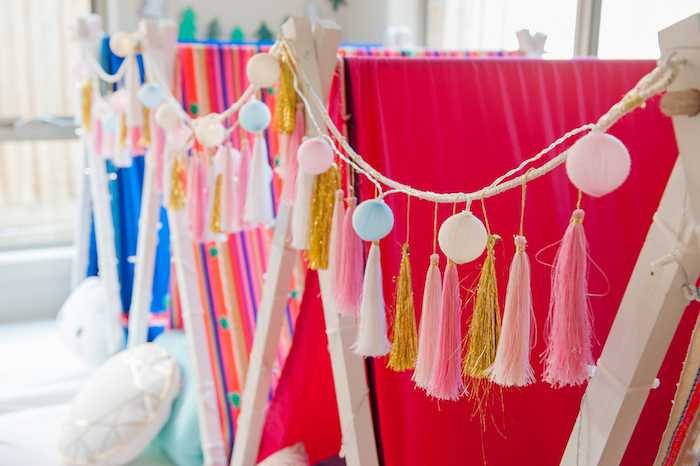 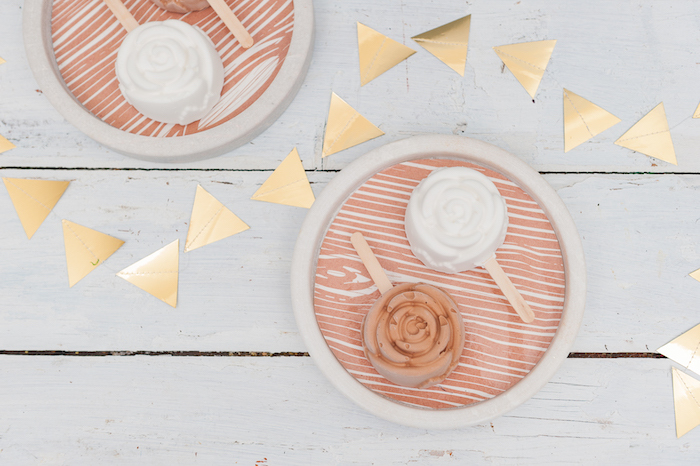 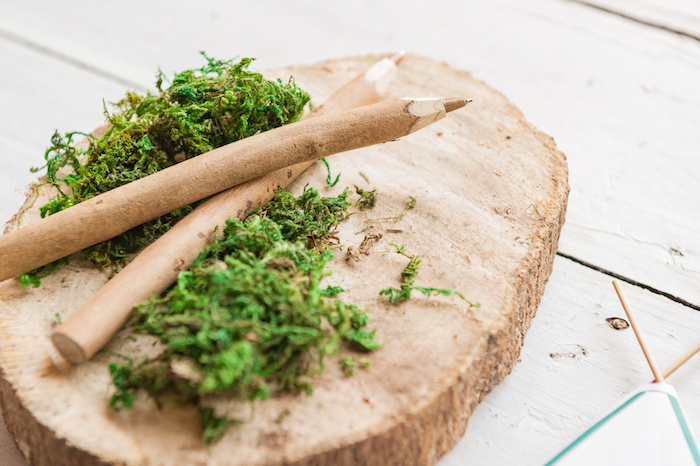 Don’t miss all of our Boho party ideas here!